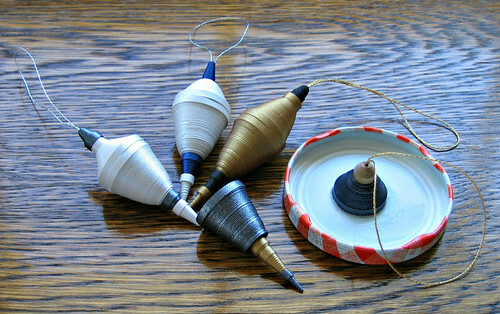 Here's a new way to use quilling paper to make Christmas ornaments. If you've never tried 3D quilling, you just might be hooked by the time you've made one or two! Roll metallic strips (they come in beautiful colors... silver, gold, copper, jewel tones, and pastels) into flat discs and shape them with your fingers, plus smaller tools you happen to have. 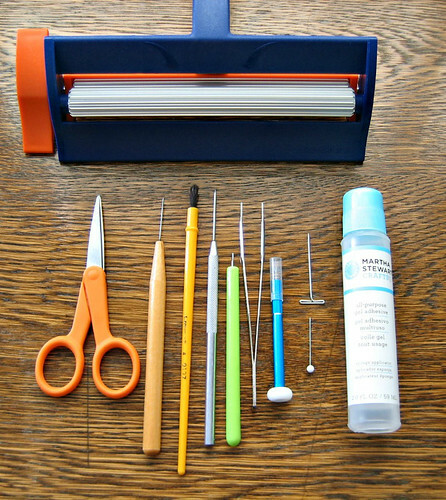 I use an assortment of makeshift tools... the rounded end of a quilling tool or paintbrush handle, glass head pin, and the pointy tip of a paper piercer for the smallest coils. There's no right or wrong way; just have fun mixing and matching shapes and colors. A finished ornament will be about 3 inches long, lightweight (it's hollow), yet very durable. 1. 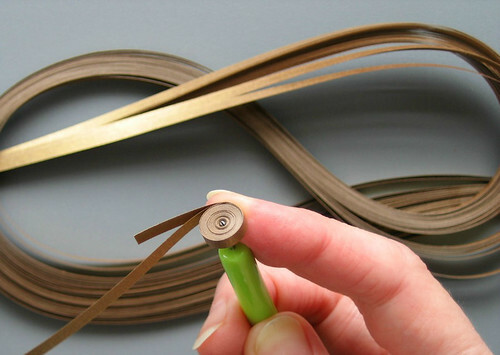 Start by rolling five or six full length strips (each is 1/8 inch wide and about 17-25 inches long depending on the manufacturer) into a flat disc using a regular slotted quilling tool. When the end of the first strip is reached, tuck the next strip about 3/4 inch under the loose end and continue rolling. Repeat with the remaining strips and glue end in place. Repeat the process to make a second disc, same size as the first. These will be the largest top and bottom parts of the ornament. a. Use even, but relaxed tension while rolling. b. A Curling Coach can be handy when rolling large discs. c. To ensure a disc is perfectly smooth, place it on a flat surface and roll back and forth across it a few times with a tool handle. 2. Shape discs: Holding opposite sides between thumbs and index fingers, gently push on the flat surface to curve it or push to a point. a. Work the paper gradually so that the sides of the shape look balanced and smooth. b. Try not to push too hard as there's a chance the center of the coil will pop out and and the coil will usually need to be re-rolled. Nooooo. 3. 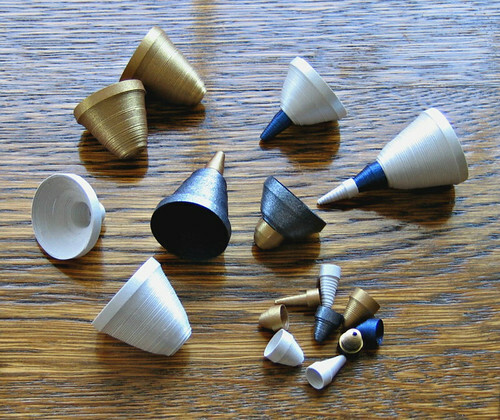 Make smaller components: The small top and bottom domed cones and pointed coils are rolled with a slotted tool using short lengths of paper, anywhere from 2.5 to 17 inches (approximate). Experiment with different tool handles and make a variety of stackable shapes. 4. Apply a thin coating of glue inside each coil with a small paintbrush. Clear the center hole of each top coil with a needle so the cording can pass through. Allow glue to dry before the next step. 5. Before gluing the top and bottom halves together, cut a 10-inch length of metallic ornament cording, thread it on a needle and insert from the underside of the top half. When the needle is all the way through, put it back down through the same hole to create a hanging loop. Tie a double knot on the underside, clip excess cording, and pull up on the loop so the knot is snug. Tip: Two-ply fine cording will making needle threading easier. 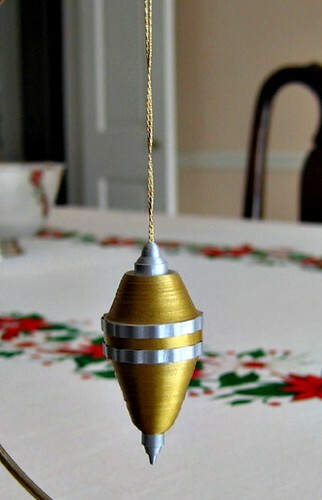 The gold I used is three ply and it was a bit of a challenge to get it through the ornament. Yay for a thimble. 6. Assemble components: Touch a coil's edge to a shallow puddle of glue. (I use a jar lid to hold glue.) Position it on another component, eyeballing to make sure it's level, hold in place for a few moments, and set aside to allow glue to dry. Tip: For a neat look, align the strip ends of each component. Consider this area the back of the ornament. 7. Last step! Glue two 3.5-inch strips together to double their strength. When the glue is dry, run the strip through a crimper and glue it around the center of the ornament. Closely align ends and trim excess paper. Tip: Work with a light touch to not crush the crimps. My all-time favorite tip: Sticky fingers cause 99% of the frustration when working with paper, so keep a damp cloth handy. Guaranteed to work wonders for your sanity. And that's it! Soon you'll have a little collection of gift-worthy ornaments. They look beautiful when tied on a package and even prettier on the tree. There are so many gorgeous metallic quilling paper colors... I used what I had on hand - silver, gold, charcoal, and blue - but I want to try all of the others too. 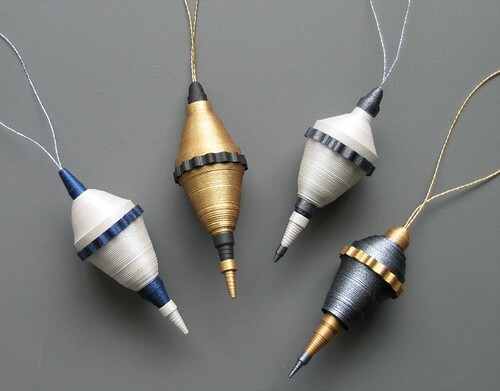 You can make about five ornaments from each package of paper so they are quite inexpensive. I used gilded-edge paper on parts of this one for an extra bit of shine. While I was rolling away, I happened to think that the ornament shapes remind me of a plumb bob (a weight used to establish a vertical line). I wasn't sure I had the right term in mind, so googled it to make sure. In a flash I came upon Haesche Collectibles. 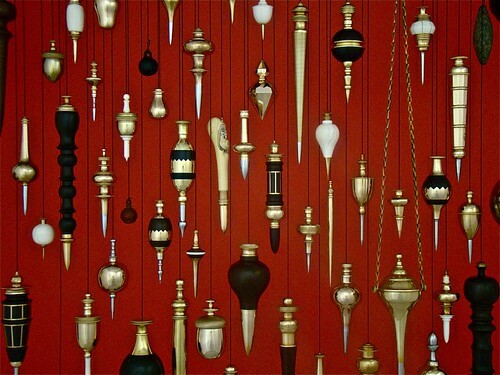 Joseph Haesche in Connecticut crafts incredibly beautiful reproductions of antique plumb bobs from bronze, brass, ivory, ebony, steel, and rosewood. Just amazing and look at all of the shape inspiration! Humor me with this last photo... the ornaments are a little blurry, but because I braved the snowy outdoors to show them on a tree (ours isn't up yet), I'm going to post it anyway. Must have piqued the neighbors' curiosity, ha! 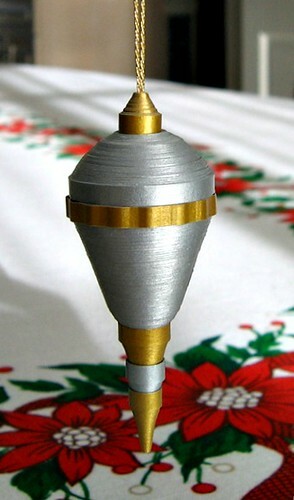 I hope you'll enjoy making some plumb bob ornaments for your own personal use from quilling paper. More paper Christmas ornament tutorials can be found here, here and here. 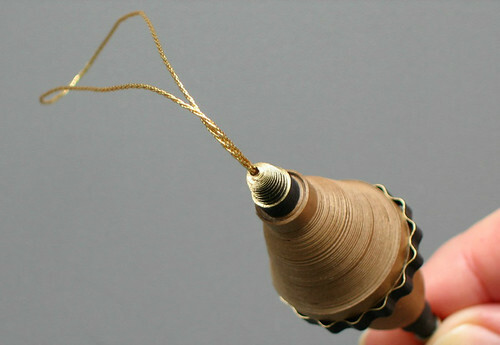 You can even make miniature rolled paper ornies to wear as a necklace instead. Oh! I just learned that Cut Out + Keep is featuring All Things Paper, the book, this week. They're sharing two sample projects and a 3-copy giveaway is underway through December 30th - nice! Beautiful!! Metallic strips do give a rich look to the ornaments. brilliant ann! gorgeous tutorial photos too - just love those color combos. standing ovation! Thanks everyone! Ann, when I'm on a roll (punny!) they take about a hour start to finish. I hope you'll find time to give them a try. Brilliant Ann!! I love your idea !! The colors and shapes are amazing. Have a great week! Love these! And your damp rag tip is a good one! I've been struggling with sticky fingers on a few projects lately - gotta try that. ann....you write a great tutorial!your pics and instructions are a delight!you certainly could have fooled me with your tree...here in oz we don't have many trees that look quiet as green as that tree. 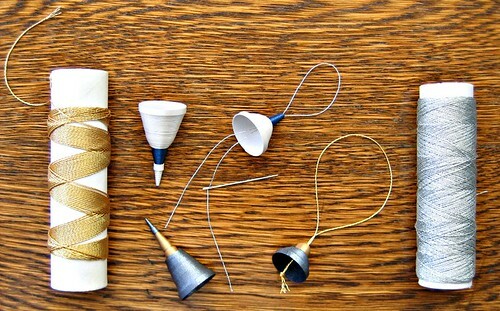 the rolled ornaments look very classy and elegant!! Aw thanks all! I hope you'll give the ornaments a try and then share your pics. I'd love to see the different shapes you create. Licia, thanks! The evergreen is a hinoki cypress and it's that same green all year round. Congrats on your book! Thanks for showing the ornament tutorial. Thanks Deborah and you're welcome! Thanks for another neat project idea! Thanks Jo and Cindy! I'm so glad you like them. Hi, These are so cute. Is it possible to make them and sell them on ETSY? Thank you and thanks for asking. All of the tutorials posted on All Things Paper are for personal use only. 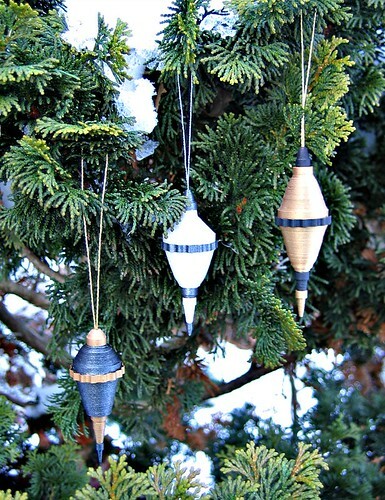 Just saw this on the Crafty Christmas newsletter...these ornaments are absolutely beautiful! Love the color combos and your tutorial is very well written. I must give them a try... Thanks for sharing Ann... You are very talented. Thanks so much, Charlotte! I haven't heard of the Crafty Christmas newsletter but it's nice this project was included. Do you have a link for it you can share? Very nice !!!!! Beautiful ornaments !